Beachfront -SMACK DAB ON THE BEACH! POOL, BEACH & FAMILY FUN! WOO HOO! Dunes of Panama, Beachfront, Sleeps 8, 2 Bedrooms, 2 Bathrooms, Family Friendly! 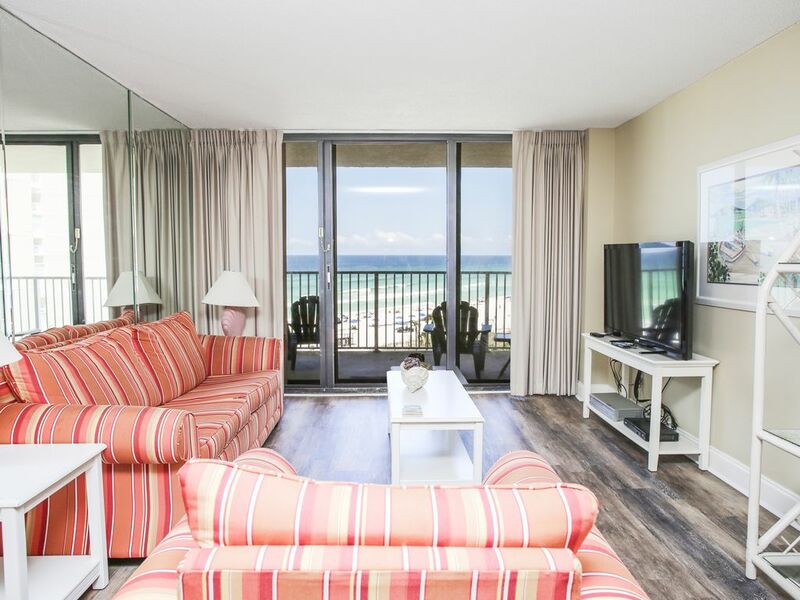 Dunes of Panama Resort rental E-605 in Panama City Beach, Florida is a 2 bedroom, 2 bathroom direct beachfront property complete with all of the conveniences of home. Families will enjoy the budget friendly nature of this vacation home and Dunes of Panama rental E-605 enjoys a great location in PCB with all of the fantastic family friendly activities located close by with easy access. Explore an expansive beachfront at The Dunes of Panama Beach Resort in Panama City Beach, Fl. Gulf and beach views from every private balcony overlooking the ocean and shimmering white sands. Family Friendly Dunes of Panama Beach Resort is packed with amenities galore! Enjoy the beach of one of the largest and private gulf-front beach resorts just off Thomas Drive at the most requested east-end of Panama City Beach. The Dunes of Panama Resort property expands over 8 acres making it one of the largest properties in Panama City Beach, FL; yet one of the quieter beach fronts to enjoy with friends and family. Pier Park is Panama City Beach’s hub for dining, shopping or just enjoying the beautiful beach cottage style architecture. Panama City Beach has really evolved into a modern beach town complete with shopping that will satisfy even the most discerning shoppers. Dining at Pier Park means that everyone will be happy as the Park offers many fantastic choices such as Margaritaville, Pompano Joe's, Back Porch, Five Guys Burgers and Fries, Hana Japan, Rum Runners and more. Enjoy an ice cream at one of two cute ice cream shops or grab a cup of joe at Starbucks. There so much to enjoy about this Panama City Beach spot night after night. Dunes of Panama Beach Resort's central Panama City Beach location makes the property a highly sought after destination along with its fantastic family friendly amenities offering something for everyone. Enjoy breathtaking direct beach & gulf views daily from your private balcony! All towels provided with the exception of Beach Towels. We encourage you to bring Beach Towels for use at the Beach during your stay. Fully equipped kitchen with everything to make a fantasic meal! The place was beautiful! We had everything we needed. We did have an issue with the dryer and dishwasher but the manager was quick to respond and had the issue resolved within a day. They also sent us extra towels to help out since I could not wash that night! Very friendly and very fast to resolve any issue we encountered. We were only a few steps from the beach and enjoy the friendly atmosphere presented. We will definitely be staying there again!! Thank you for your feedback! We are so glad to hear that you enjoyed your stay! Come see us again in the future! - Both the top and bottom doors on the refrigerator were covered in what appeared to be rust stains that could not be removed. Thank you for your feedback, we truly appreciate it! Our sincerest apologies for any inconvenience you've incurred as our guests enjoyment is of utmost importance. We will be notifying the owner of updates that need to be done on the unit. We truly care for our guests and hope that you'll give us another chance in the near future. Thank you for your feedback, we truly appreciate it! We'll have maintenance check in on the air conditioner asap. New updates as of 7/15/18!! We really enjoyed the dunes of Panama Condos, loved being on the beach and the condo was neat and comfortable. the only thin I would like to have been better was to have been able to stay longer. was very pleased! I would suggest more cooking dishes or better cooking pans! Thank you for choosing us for your beach getaway! We're very happy that you enjoyed your time in Panama City Beach and would love to have you join us again in the near future! Cooking dishes and pans, check! The owner will be notified asap with your suggestions. Thanks, again, and don't be a stranger! The beach on a budget! We loved it here and would return! Finding a "budget" friendly condo is getting harder and harder!! Dunes was great, the property was great, Panhandle Getaways were easy to deal with!! All in all we had a great time and will def be looking out for dates here next yr!! We're very happy that you enjoyed your time with us in Panama City Beach! And, we can't wait to see you again next year! See you soon! The property was nice and we loved the pool. The condo was in need of updating and repair. The beds were not nice, one was broken and that left my elderly mother sleeping on the couch. We had to go out and purchase toilet paper, dish detergent, and trash bags for our stay. The dining room chairs were not reliable to sit in with some of the arms broken. We went and looked at other units and they were extremely nice and did not compare to the unit we stayed in. With all of that being said, we did enjoy our family time together. Thank you so much for your feedback! New updates as of 7/15/18! !